Glenna Gannon and Heidi Rader kneel by the research plots. 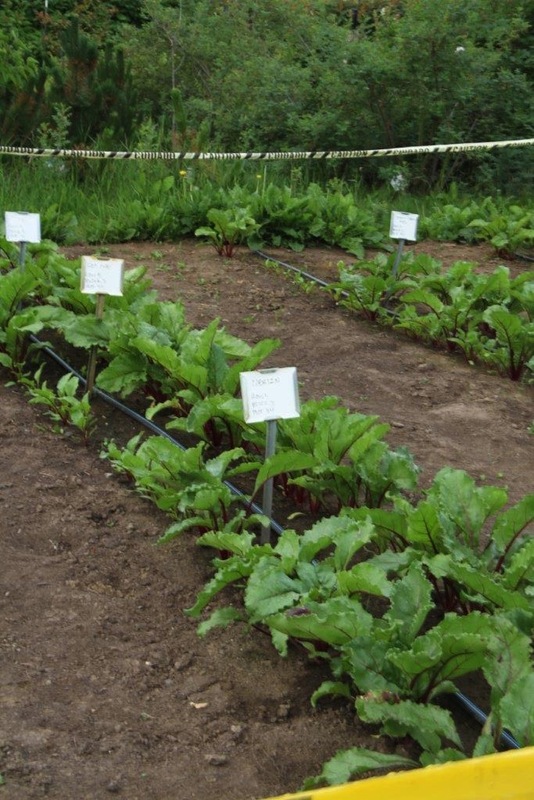 After an eight-year hiatus, limited vegetable variety trials resumed this summer at the Georgeson Botanical Garden in Fairbanks. Tribes Extension Educator Heidi Rader is coordinating the five-year project. The idea is to see which vegetable varieties perform best in Interior Alaska and possibly other locations. “Generally, seed companies aren’t testing to see if varieties are growing well in Alaska,” she said. Four varieties of beets are planted at the garden. Finding vegetable varieties that grow well in Alaska has been a goal of experiment stations from their earliest days. Agronomist C.C. Georgeson published his first circular that recommended vegetable varieties in 1905 — a year before the Fairbanks Experiment Station and farm opened. At the time, other experiment stations operated in Sitka, Rampart, Kodiak, Kenai and Copper Center. The Agricultural and Forestry Experiment Station in Fairbanks conducted vegetable variety trials annually for many years before they ended in 2009 due to budget cuts. The current project got a slow start this summer because Rader only learned at the end of April that she would be taking over the trials, which are supported by a federal grant. Two people were hired quickly and, once they started June 1, it took two weeks to develop the ground at the garden for the vegetables, she said. Previously, trees and blueberry bushes occupied the space. Two 20-by-60-foot plots were prepared near the peony plots. Altogether, four varieties each of carrots, beets, daikon radishes and turnips are being grown at the garden in Fairbanks Daikons are white radishes with a long root. Each variety is replicated in two additional plots to allow for variations in soil quality. Frost cloth or row covers protect the radishes and turnips from pests, including root maggots, and yellow caution tape surround the plots — to announce that the research plots are off-limits to visitors. 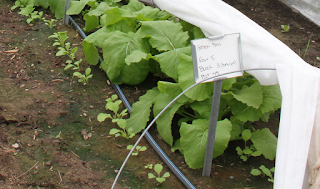 Frost covers protect radishes and turnips from root maggots. As the vegetables mature, they will be evaluated for yield, taste, plant and seedling vigor, harvest period and susceptibility to pests. Graduate student Glenna Gannon is doing most of the work at the garden this summer with the help of an assistant. For the first year, Rader chose well-known cultivars or varieties that were previously tested here as well as other varieties that have not been evaluated before but are described by seed companies as cold-tolerant. New varieties are developed all the time, she said. The trials of those vegetables and others will repeat for three years with the end goal of updating an Extension publication on recommended varieties that farmers and gardeners can use. Rader hopes to find a larger space at the Fairbanks Experiment Farm to continue and expand the trials in subsequent years but, because of limited funding, the scope of the project will remain smaller than what has been done historically. 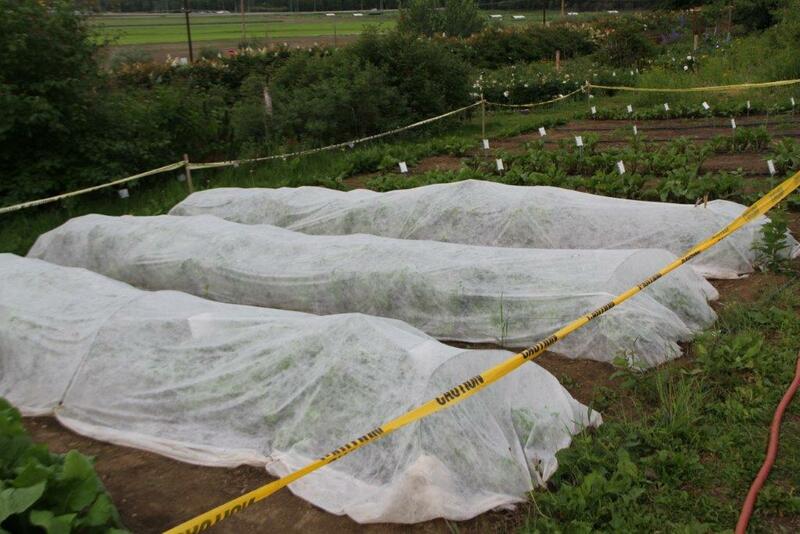 Rader also hopes to expand the trials next year to the Matanuska Experiment Farm. are being grown in the variety trials. While Rader is enthusiastic about testing the varieties, she’s also continuing to improve and promote the Grow & Tell app, which allows gardeners and farmers around the state to enter data about the varieties they have grown. The idea is that others can see what grows well in their area. Rader says this is a much more comprehensive approach to field testing varieties throughout Alaska. She hopes that the variety trials and the app will help gardeners to choose the best varieties for their location. The Georgeson Botanical Garden website at www.georgesonbotanicalgarden.org and circulars and variety trials on the School of Natural Resources and Extension website contain the results of vegetable trials at the farm going back to 1979. Rader said a database has been purchased to show the results of all past variety trials. While they are not part of Rader’s variety trials, six varieties of zucchini are being tested this summer at the Matanuska Experiment Farm, according to Director Susanna Pearlstein.